Why F.R.I.E.N.D.S Is One Of The Most Loved & Cherished Show! I don’t think this show needs any intro but still for those who don’t know(If there are some? check it out!! you are missing so MUCH) Its is a Show about 6 people in their 20’s try to survive in the real world. 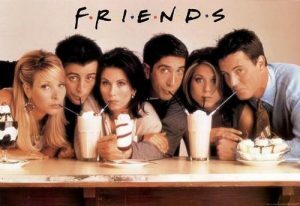 It’s a Sitcom that shows the lives of these 6, the up & downs, love, friendship, heartbreaks & much more. How F.R.I.E.N.D.S became My Favorite Show? My Stress Buster My Mood Lifter!!! I still remember the first time I watched or say tried to watch F.R.I.E.N.D.S, I was in 8th & I wanted to give it a try but trust me just after 10 minutes I called it quits, I know friends fan might wanna beat me trust me I feel like too but that time I didn’t like it(how much has changed now 🙂 ) it felt like its a show with leads making double meanings jokes & time pass, nothing special or different(don’t kill me .. hear me out first) until I gave it a Second Chance. That was after I completed my 12th & waiting for my result I was bored & I thought of giving F.R.I.E.N.D.S a try again. I saw how much fan-following of F.R.I.E.N.D.S is, how much people adore it & I looked up online & trust me from the First Episode itself I was HOOKED… I completed all seasons in just 3 days & today I might have seen all the episodes at least 8-10 times but still every time it makes me laugh! Today F.R.I.E.N.D.S has become a Stress Buster & Mood Lifter for me, whenever I’m down or sad F.R.I.E.N.D.S is the only one that can cheer me up. This caught me in Thinking what changed?? What was that which made me love the show which I hardly tolerated for 10 minutes before?? Why is F.R.I.E.N.D.S so Special ?? Broken Heart pains the worst, people say it good to have loved & lost than never finding love at all. The idea of having someone whose whole world is You is fascinating but when it see the end, it not only taken away your happiness but it also takes away a part of you. When two people are madly in love & want to have a life together but destiny has some other plan. it tears two souls apart & there is no pain worse than that at least on the emotional level. The pain, suffering is unbearable & there is no better remedy to a broken heart then Music. it may not lessen the pain but it might help to bear it. Here is a Song that describes the Pain of Start Crossed lovers So Beautifully it will touch your Soul! It will definitely make you remember Someone whom you love Badly. Why is with just my first heartbeat the existence of my life is put at risk? Why kill me before I breathe? Just because I’m a girl, not a boy! Why is when a boy is born parents are congratulated saying what a luck you have at the same time a girl is born parents are consoled saying they still have a chance? Why my birth is not celebrated as that of birth of the boy? Why is my every right- the right to freedom, right to education, right to speech even right to live is snatched away? Why do I have to fight for my right? Why a girl’s education, career, dreams are up for question? Why am I treated as a liability, responsibility that just has to be dealt with? Life throws up new challenges for everyone every single day. No matter how big or tough the situation is, you got to face it. A bad situation might teach you a lesson of a lifetime while a happy situation might make a beautiful memory. 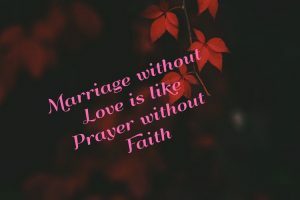 Marriage is a beautiful bond you create with someone for a lifetime, never push yourself in this bond until & unless you know that you found the one!